Power laws are a fascinating, complex and useful way to understand collections of data. (See Robert Prechter’s discussion of power law arrangements in nature and social mood in The Wave Principle of Human Social Behavior, pp. 43-46). Of particular note in the power law universe is Zipf’s Law, which states that word frequencies in books are approximately predictable. The second most common word in a written work will appear about half as often as the first, and so on. Last summer, authors Aaron Gerow of Trinity College Dublin and Professor Mark Keane of University College Dublin presented a paper titled “Mining the Web for the ‘Voice of the Herd’ to Track Stock Market Bubbles.” Zipf’s Law provided the authors’ guiding principle as they compared financial news reports to market activity. In the end, they made a provocative claim: The diversity of language in financial reports trended inversely to the trends of the markets they covered. In other words, as markets rose, the language people used to describe them became more uniform. Conversely, as those markets dropped, descriptive language became more diverse. The authors measured the frequency of common verb and noun phrases in finance articles and then compared each week’s findings to the stock market. They found that as markets rose, the dominant power law sets became even more dominant. The researchers used automated Web searches to find articles relating to the Dow Jones Industrial Average, the Financial Times Stock Exchange and the Nikkei 225 from January 1, 2006 until January 1, 2010. The articles, exposés, editorials and popular pieces appeared in the New York Times, the Financial Times and the BBC.1 The searches yielded 17,713 articles containing more than 10 million words during the four-year span. The authors split the entire selection into weeklong windows averaging 87 articles each and then calculated the power law distribution for the words used in each. They then compared the differences week-to-week to determine how frequent the most common verb-phrases and noun-phrases were over time. The researchers discovered that the most common phrases became even more common when the market rose and that unusual phrases became more common when the market fell. The correlations between verb phrases and the market’s price direction were particularly notable, with a strong positive correlation of 0.79 for the DJIA, 0.78 for the FTSE and 0.73 for the Nikkei, where the range is between negative one and one. Figure 1 illustrates this correlation. By now you may have surmised that the findings relate to socionomics. They provide one more example of social mood’s impact on group behavior. Why would financial reporters’ expressions resemble each other more when positive mood was increasing and less when negative mood was increasing? The Wave Principle of Human Social Behavior (HSB) offers a good place to start: “A waxing positive social mood appears to correlate with a collective increase in concord … a desire for togetherness … and feelings of alignment with others. 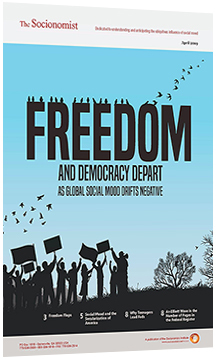 A waxing negative social mood appears to correlate with a collective increase in discord … a desire to separate from others … and feelings of opposition to others” (p. 228). So, perhaps in times of increasing social mood, the herd is happily scribing together in many similar ways. When negative mood is increasing, the herd is panicking together in many diverse ways. There is a socionomic parallel to their idea in music. HSB noted, “in bull markets, most people like similar styles of music; in bear markets, the dominant types are often very different.” Basically, there are many ways to explain and express the emotions arising from negative mood, but positive mood tends toward narrower bounds of expression. The Socionomics Institute’s research fellow at Cambridge University, Matt Lampert, noticed that there may be another way to look at Gerow and Keane’s data. Take a look at Figure 2. Observe that both the Dow (blue line) and word homogeneity (red line) peaked in 2007 and then moved lower together for about a year. But the two lines diverged between August 2008 and March 2009 (see arrows), even though the market was still falling. Word homogeneity trended higher for six months before reaching an interim peak around the time of the Dow’s bottom in March 2009. Then both lines reversed course for three months, still moving in opposite directions, before getting back in sync. In all, the two lines went in opposite directions for about nine straight months, moving contrary to the authors’ hypothesis. We suspect that the trends of these lines may point to a more subtle socionomic explanation for their behavior. That is, the lines actually reflect the shifts in consensus that occur among investors within both up and down trends. Early in a trend, there is much debate. Late in a trend, most people are in accord about the market’s direction and the reasons for it. Late in the 2002-2007 advance (where the authors’ limited data begin), investors were mostly in agreement. Then, early in the ensuing decline, there was much debate. Later in the decline, word usage among reporters became more homogenous again, reflecting a newly emergent consensus, though this time toward the market’s downside. Then early in the ensuing uptrend, they were again debating for a while before reaching a consensus. For a socionomist, then, the authors’ conclusion that rising markets generate report consensus and falling markets generate diversity might be overly simplistic. To test this possibility would require a longer-term statistical investigation. 1Gerow, A., & Keane, M. T. (2011). Mining the web for the “voice of the herd” to track stock market bubbles. Proceedings of the Twenty-Second International Joint Conference on Artificial Intelligence, 2244-2249. 2Word herd. (2011, July 31). The Economist, 68.